Product categories of Hand Mixers, we are specialized manufacturers from China, Hand Mixers, Stand Mixer suppliers/factory, wholesale high-quality products of Kitchen Hand Mixer R & D and manufacturing, we have the perfect after-sales service and technical support. Look forward to your cooperation! 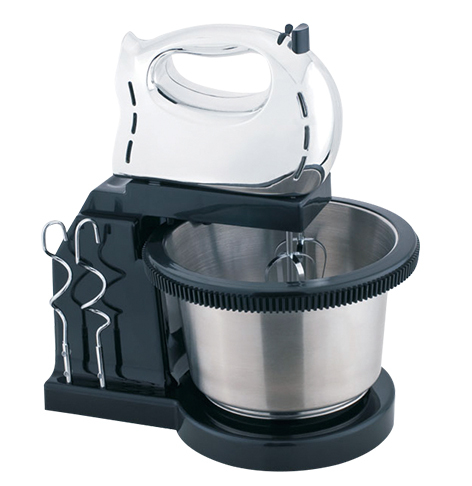 Hand Mixers are machines that can whisk eggs and cream to solid or mix dough. Hand mixers including just hand mixers and hand mixers with bowl. In addition, hand mixers with bowl can divided into hand mixers with rotary plastic bowl and hand mixers with rotary S/S bowl. Usually, hand mixers with bowl are more convient and effiency, they can not only beat eggs and cream, but also can mix dough and do not to hold the hand all the time.